JMS was founded by Otis Norcross and in business from 1810 until about 1955. The firm was named for Jerome Jones (joined in 1853), Louis P. McDuffee (1863), and Solomon P. Stratton (1866). JMS sold an extensive line of Wedgwood tiles and plates (reportedly 1100 different views, many of American historical subjects), as well as pottery from other British makers. The patterns were occasionally produced on wares, without the calendar. The tiles are rectangular and vary slightly in size, with a maximum of approximately 4.9 by 3.4 by 0.3 inches thick. Early examples were decorated in various colors, but by the early 1900s only brown/sepia was used. The first two years of production featured only a calendar. The only production data known is that in 1910, 12,000 tiles were ordered. It is unclear whether the calendar tiles were sold or given away free as advertising, but each tile has either one or two holes at the top, clearly indicating that they were meant for display. “WEDGWOOD ETRURIA ENGLAND." appeared on the edge of all tiles from 1917 to 1929, and at various locations on the front of some earlier tiles. There were 81 known color variations produced during the 52 years of production. There are no documented examples from 1884. On the reverse (calendar) side, printed in black, is the 1898 calendar with the following text: “Jones McDuffee & Stratton, Co. Pottery Merchants, Boston USA." 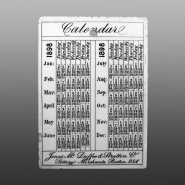 An advertising calendar tile, dated 1898 printed in black. Wedgwood produced these tiles for Jones, McDuffee & Stratton (JMS), a Boston, Massachusetts pottery retailer. The series was produced from 1879 to 1929. The 1898 design was also produced without the calendar, in black. The obverse is a view of the Kings Chapel. Text on obverse lower left corner reads: “King’s Chapel Boston. Built 1686. rebuild 1749." Near the bottom center are the initials “J McD &S." On the lower right corner is the maker's name, “Wedgwood Etruria England." The church is still used today by a congregation Unitarian Christian in theology, Anglican in worship, and Congregational in governance. The church looks much the same today as it did in 1898.